This Savoy Taylors Guild suit is designed to be a staple with its minimalist design. 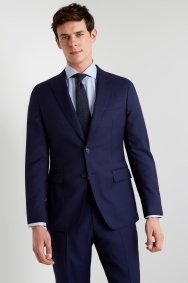 A classic 2-piece blue suit with sharkskin texture through the fabric, it meets the dress code for smart business days and all sorts of events. 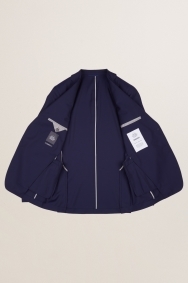 The 100% virgin wool ensures you look polished and it feels soft and breathable for comfort. 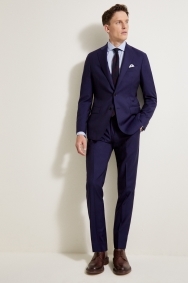 It’s a flattering suit that’s tailored to create subtle shape through your waist and taper slightly down your legs. 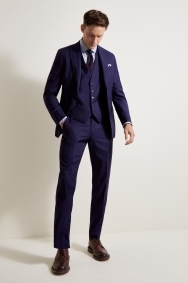 You can style this versatile 2-piece suit in a number of ways. A blue shirt and navy tie will create an on-trend tonal look or you could add some more colour with a white shirt and contrasting orange or wine tie.